Even if a ribbon costs me $20.00 I can get more out of it than a $20.00 ink cartridge. Oh yeah, the ink cartridge and toner cartridge business is exploitative and ridiculous. I'm fortunate in that respect, I think. 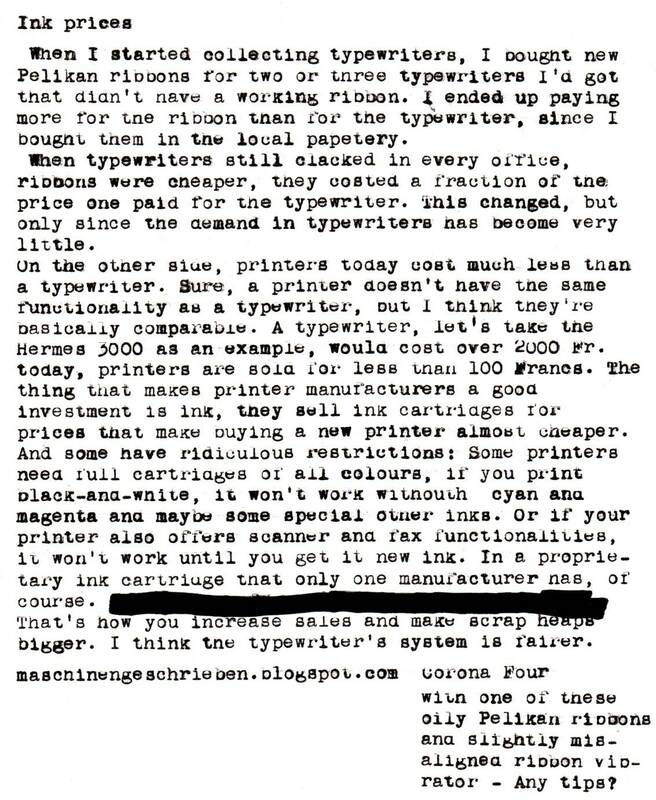 In Mexico, typewriters are still in the lower part of the depreciation curve, where they are still considered "obsolete, no-longer-functional antiquated office equipment" by most people, and only a few geeks like me think of them as "collectible". That said, it is still posible to get new ribbons in several large office supplies stores for about $5 USD a package with two ribbons. Not exactly cheap, but not as expensive as the typewriters. And being made of cotton, they last for a long time, so it's an investment that can be amortized over an extended period of time. ... As for printer inks, there's a not-so-small industry here that sells refurbished cartridges for many brands and models of inkjet and laser printers. You can even buy "Do it yourself" kits to refill your spent cartridges, though that's a risky business because some printers won't accept generic ink. 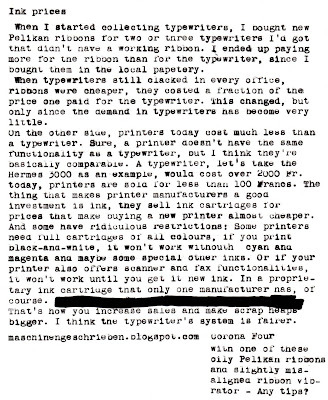 I've seen many a dead printer (HP mainly) that died because its ink condcuts got clogged with generic ink. But like you say, these days it's cheaper to buy a new printer than fixing an older one. In the UK at least, printer manufacturers have to recoup any losses on cheap printers in one or two years with original brand cartridges. After that, the market is open to third party replacements which are inevitably cheaper - though not always as reliable! My worst experience, ironically, has been with hp-specific Pelikan replacements. Ink everywhere but on the paper! My solution - don't use a printer. There's hardly any need.